Johannesburg (AFP) - Al Ahly of Egypt take a 3-1 lead over Esperance of Tunisia to the CAF Champions League final second leg Friday against a backdrop of a tarnished African club football image. The first leg in Alexandria last weekend was marred by two controversial VAR (video assistant referee) penalties for Ahly, with Walid Soliman converting both. Furious Esperance players and coaches accused Ahly striker Walid Azaro of diving to win the first spot-kick and of feigning injury and tearing his shirt for the second. 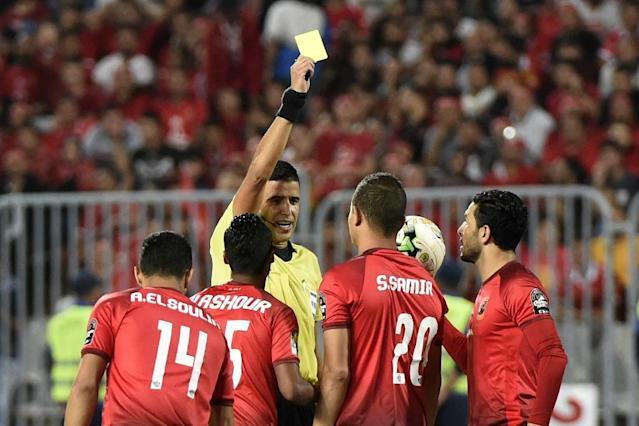 The Tunisians accused the Algerian referee of bias and the Egyptians of pre-match dirty tricks, including delaying their arrival at the stadium and police harassment. African governing body CAF banned Azaro for two matches, but rejected an Esperance plea for the first-leg yellow cards of Chamseddine Dhaouadi and Franck Kom to be cancelled. The Champions League final drama came just a week after two CAF semi-finals matches also shamed African club football. Esperance defeated Angolan visitors Primeiro Agosto 4-2 in Rades to reach the final after 51 police and spectators were injured in clashes and 12 arrests made. Spectators flung stones, police fired teargas and as smoke from flares drifted across the pitch, visibility became difficult for a period of the second half. Serbia-born Primeiro coach Zoran Manojlovic said the situation was akin to a "horror movie", but CAF took no action. A day later, Al Masry of Egypt walked off the pitch to protest a goal scored by V Club of the Democratic Republic of Congo in the second-tier CAF Confederation Cup in Kinshasa. They claimed a goal that put the hosts three goals ahead was offside, but big-screen replays proved that the Seychellois match officials made the correct call. Masry returned to the pitch after five minutes and their action has also gone unpunished to date. Patrice Carteron, the first French coach of Ahly, believes the experience of his squad will stand them in good stead in a potentially explosive second leg against Esperance. "We are fortunate to have many players sufficiently experienced to deal with this kind of match," he said of a team chasing a record-extending ninth title for the Cairo Red Devils. "I hope the team receives special protection and that the Tunisian government ensures we have a football match, and not a war in the stands." Apart from Azaro, Ahly will miss experienced full-back Ahmed Fathy because of a thigh muscle injury sustained in the first leg with Mohamed Hany the likely replacement. Esperance coach Moine Chaabani, promoted when Khaled Ben Yahia was fired after a first-leg loss to Primeiro, believes his team can recover and become African champions a third time. "We can recover from 3-1 behind -- there is still hope. A key issue is keeping my players focused on football with so much else going on," he said. Chaabani is angry at the losses of centre-back Dhaouadi and Cameroonian midfield enforcer Kom, whose second yellow cards of the competition triggered automatic one-match suspensions. "Dhaouadi was booked for no reason, so was Kom. It is as if they were targeted (by the referee) from the get go. "I am livid at what happened in Alexandria, but have to keep it together for the sake of the team. We were subjected to an extreme injustice." At stake is $2.5 million (2.2 million euros) for the winners with the runners-up getting half that amount. The African champions also qualify for the FIFA Club World Cup in the United Arab Emirates during December with a minimum of $1 million prize money.